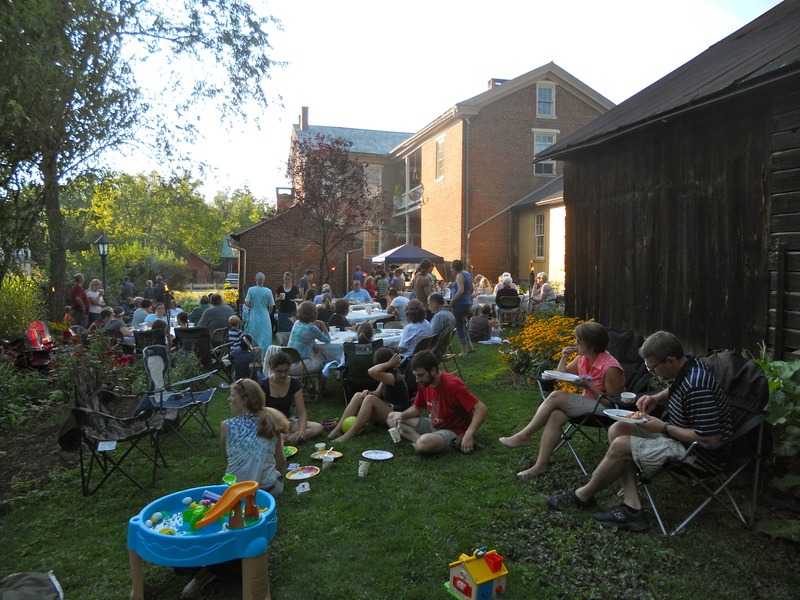 My mom and I were invited to McBurney Manor’s Pizza Gathering and spent the entire summer anticipating it. The first event was scheduled for June but Mother Nature didn’t cooperate, so it was pushed to an absolutely gorgeous August evening. 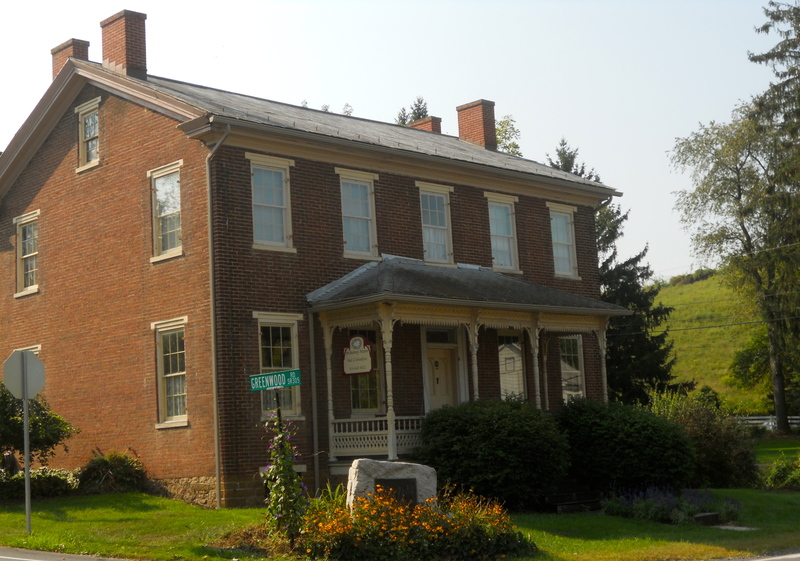 McBurney Manor Bed and Breakfast is in McAlevy’s Fort, about 15 miles south of State College, owned by Nancy and Jay Yoder. Besides the B&B, Jay has his furniture-making workshop at the property. And then, there is the bake house. 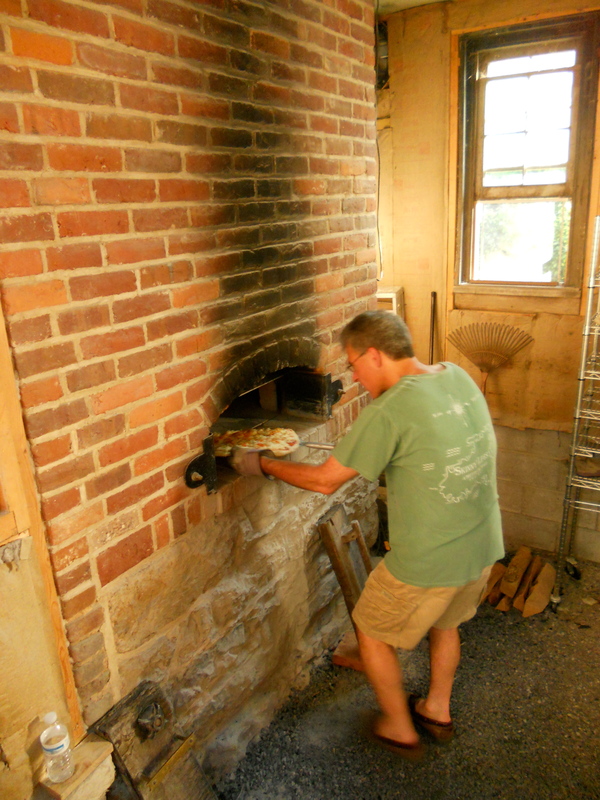 During the week, Lisa Hershey of LeFevre Bakery bakes artisan breads in the McBurney Manor bake house, a beautiful restoration-in-progress brick building next to the manor. But, when the Yoders get the itch to entertain, they plan a Pizza Gathering. Nancy begins the starter for the pizza dough 14 hours prior to mixing the dough on the morning of their pizza bakes. In August, her batch of pizza dough resulted in 55 16-ounce pizza crusts. A fire is built in the bake house oven eight hours before it is hot enough to use. With the fire burning in the back of the oven, and temperature reaching 650 to 700 degrees, the crusts are pre-baked for 5-10 minutes the afternoon of the gathering. As evening approaches and guests cross over a wooden bridge, youngsters splashing in the creek below, the bake oven prep room is bustling. All of the fresh vegetable toppings were gently prepared by stir-frying them in olive oil the day before the bake. Just before each pizza goes into the oven, the toppings are assembled. Then, each prepared pizza is carefully placed on the oven’s baking stones using a long-handled peel, and baked for another 5-10 minutes. The work involved for one Pizza Gathering seems overwhelming, but it is small compared to the on-going renovation of the bake oven building. The brickwork was disassembled, Nancy and Jay cleaned each brick with chisel and hammer, and then the masons reused them. The Yoders began the bake oven project in March of 2011 and they’re still at it. The original purpose for the brick building was the four-seat outhouse at the far end—McBurney Manor was built in 1844, mind you. The room next to the outhouse was the smokehouse, then the bake oven room, and kitchen.